Labor Day weekend is known to be one of the most popular camping weekends – everyone wants to fit in one last weekend in the outdoors before the leaves and temperatures drop. If you’re spending your weekend in the outdoors, you have likely booked your campsite, or at least know where you’re going. But do you know what you will eat all weekend? 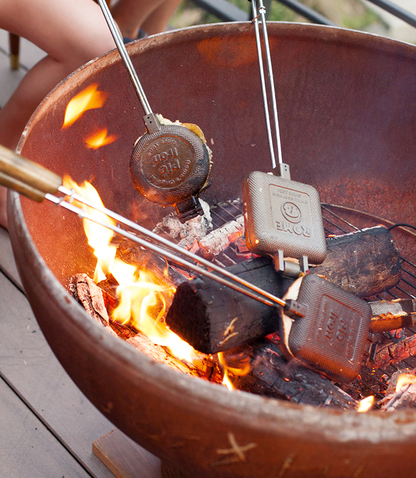 With only a campfire to serve as your regular kitchen appliances, many think of hotdogs and brats, s’mores, and maybe even the aluminum foil Jiffy Pop popcorn to get them through. However, you don’t have to limit yourself to these camping staples – there’s so much more that you can do with a flame! We’ve looked up some recipes, and even reached out to our employees to see what they cook over the fire. Robert of the Madison, Wis. office, says that he used to make “Pudgie Pies” when he camped – sandwiches warmed up over the campfire in a pie iron. The staples are bread and butter, and the rest is up to you. Robert recommends filling them with pie filling for a tasty dessert, or pizza sauce, mozzarella cheese, and toppings for a pizza pocket. DeAnne of Madison recommends dessert wontons which require a hot fryer placed over the campfire. These are best made with premade wonton wrappers with any filling and a sugar and cinnamon mixture. Place a spoonful of filling into the center of the wrapper, fold in half, and place into the hot fryer (with boiling vegetable oil) over the fryer. Once cooked, remove from the oil and place into a metal bowl lined with paper to absorb the oil. Lastly, place the wontons into another metal bowl to coat with the sugar mixture. 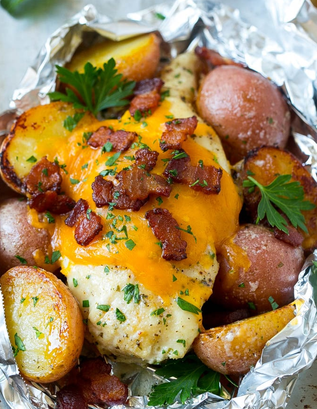 Foil-packed meals, according to Marie of Contoocook, N.H., are another way to reach endless possibilities around the fire. From grilled chicken and steaks, to potatoes and vegetables, it is easy to have a well-rounded meal in the woods. Marie says one of her favorites is a grilled banana boat with chocolate chips, mini marshmallows and nuts. Orange cakes were one of the most unique recipes found online, and one that only takes a few ingredients. All it takes is a cake mix, oranges, tin foil, and a mixing bowl. Finding the perfect cake mix is left to your judgment, but it is recommended to use one with the least amount of added ingredients. Next, carve an opening in the top of an orange and remove the fruit inside. 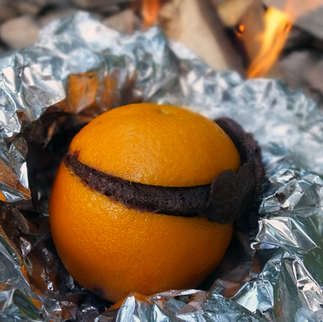 After mixing the cake mix, fill the orange rinds about 2/3 high, wrap in tinfoil, and place over the fire! Other ideas: Dinty Moore Beef Stew and Cubano sandwiches in a pudgie pie are both good dinner ideas. What are some of your favorite campfire recipes?